Beaches are places where the disciples spent a lot of time. They're also the places where people today spend lots of time! I'm not a surfer or someone who can spend lots of time on a beach! I prefer to be up somewhere exploring! But in Jesus' day, the disciples were by the beach because they were fishermen. When Jesus called his first disciples, he called fishermen - two brothers, Simon Peter and Andrew. He then went on to call another two brothers, James and John. Matthew 4.18-19 - As Jesus was walking beside the Sea of Galilee, he saw two brothers, Simon called Peter and his brother Andrew. They were casting a net into the lake, for they were fishermen. ‘Come, follow me,’ Jesus said, ‘and I will send you out to fish for people.’ At once they left their nets and followed him. The picture was taken in Cornwall in England. 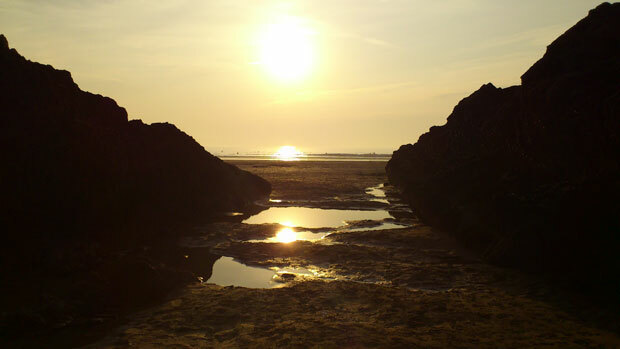 The sun blazed down onto the late Spring evening between two rocks, reflecting on the pools that had remained from the retreating tide. The sun between the rocks reminds us that the Son of God, Jesus, must be central in our lives. His light is bright, warming and glowing! First of all, he sat cooking and watching his disciples, unknown to them. You know, Jesus is always watching over us and with us, even when we don't see him! Secondly, the disciples were struggling without him... In the same way, our lives are a struggle without Jesus. But when Jesus intervened and told the disciples where to cast their nets, they obeyed. Our obedience to God always brings results and things happen!! Notice that Jesus called them 'friends'. Did you know that Jesus calls you his 'friend'?! It's amazing isn't it! The disciples had to haul their nets 180 degrees across to the other side of the boat. Sometimes, God's plans seem unusual and he may even ask you to turn 180 degrees. If God speaks and we obey then we will see what the disciples saw... When they threw their net on the right side of the boat, they found more fish than their nets could contain. God often calls us to do something where the results are beyond anything we could imagine. But never forget that it's God's Word or words that make things happen. We obey, God brings the results. When the disciples pulled up their boat, Jesus had cooked for them. What an amazing and loving act. A Prayer: Lord, thank you that you call us friends. Thank you that you sat on the beach, watching over your disciples and you watch over me. Thank you that as we obey you, you make things happen. All this is for your fame and not for our fame. You are our provider, you are our daily bread. Thank you Lord. Amen.